Steampunk Phantasm Assisted Opening Pocket Knife - BOGO | BUDK.com - Knives & Swords At The Lowest Prices! The Phantasm Pocket Knife exudes unique steampunk style, but its exquisite design radiates far beyond a single genre. Delicately etched with dazzling golden swirls and subtle gray orbs, the 3 1/2" black-coated stainless steel drop point blade is nothing short of stunning - perfect for display in a steampunk- or fine cutlery collection. But that's not to say the Phantasm can't hack it in the real world! It's also great as an everyday carry folder, with its carefully honed, razor sharp blade edge. The Phantasm's advanced assisted opening mechanism allows for silky smooth, lightning fast one-handed blade deployment with just a nudge of the ambidextrous thumb studs and/or flipper. 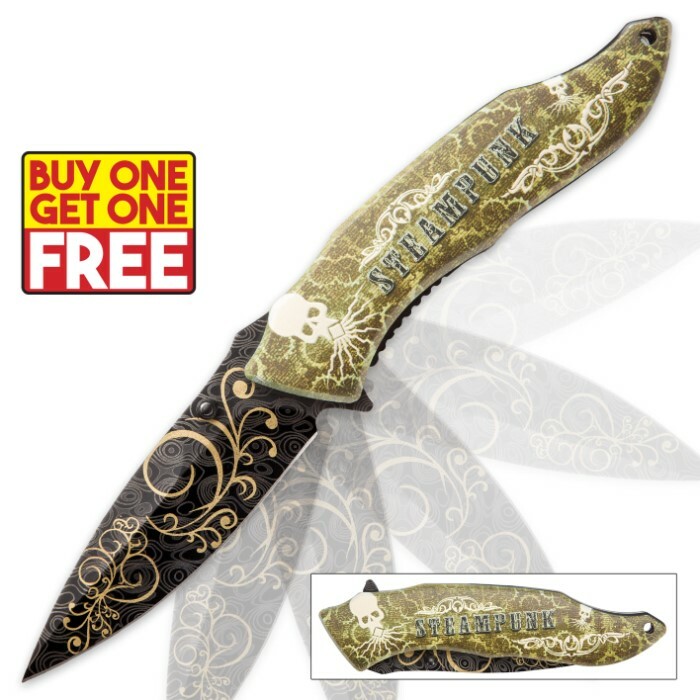 Brilliantly colored and intricately patterned, the tough polymer handle scales feature alluringly detailed graphics, including a diverse melange of gears and an exclusive kraken skull motif. "Steampunk" is emblazoned across the handle is classic Western sci-fi lettering. There's no question - the distinctive Phantasm Assisted Opening Pocket Knife is ideal for steampunk aficionados, knife collectors or anyone who simply appreciates fine art and craftsmanship. And you won't find this one-of-a-kind folder anywhere else, so order today, before they vanish like a phantom in the night! Act quickly and get two of these unique pocket knives for the price of one! I received a knife once from BUDK that had a scratch on it. The return label comes with your billing in the package. I sincerely hope you took advantage of using it since it cost you nothing and the company would have surely replaced your knife that had the problems at no cost. That's what they've done for myself and everyone else I've known that has had a problem. Good luck with your future purchases. Got these on a buyone get one free. One came in really well, centered blade, strong lock and all that. But one came with a really wobbly blade thats completely messed to the side. The handle was basically coming off. I'm going to skin it and use it barebones. Overall wouldn't get a 5 from me. Also no pocket clip!